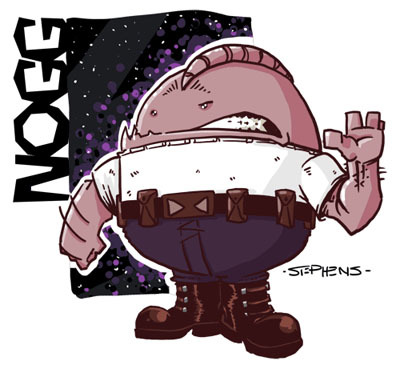 A piece of awesome fan-art from Stephens of the webcomic Space Slugs. This must be a picture taken before his spirit was crushed from continual defeat. (and as ever, this drawing will be archived on the fan art page). If the world crashes and burns Wednesday or Thursday, I won’t be here to save you. Going camping with Daniel, where we will do camping things like building fires and sitting. 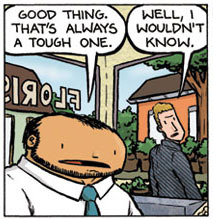 As long as you enjoy making this comic, please don’t stop. My early morning Mondays and Wednesdays would be lacking without it. Also Pierrot and Emily are the best couple ever. @Lombardi: Chris lives in Seattle, which is three hours behind the East Coast. And do you need some flowers for your sweetie, Chris? Chrysanthemums, was it?? I think they were the snack critters from back in book one? No, those were the furryites. @Herander, ha! Um. Uh. Of course not. @Pastordan, they’ve been mentioned here and there as being similarly discriminated against as eebs, only that eebs it was for their power, for Tornites it’s been implied it was because their planet was really useful. Here’s some natives. The question mark in panel 2 makes no sense. It should be a comma. In panel 4, “the Eeb’s home planet” should be “the Eebs’ home planet”. Unless there’s only one Eeb in the universe. Actually, the question mark in panel 2 makes perfect sense to me. The words and the question mark to me mean “What’s the worst thing you could do to me? Well, Qwhantoo would do worse.” But only ten words instead of fourteen. family 😛 it’s all about family. So, a month’s gone by and the comics for early May are still showing as pencil sketches. Are these ever going to be replaced with colored versions? @Harry, Julia’s right. And you’re right. It is not technically a question, but this is dialogue, and there is an implied question of “what WOULD you do to me?” I was hearing it being said with questioning inflection. BUT, I will think about it. I might change it. @Nboady, they will be, trust me. But I’m still playing catch-up. And with Minneapolis in a few weeks, we’ll see when it happens. But it will. @James Austin, the Tornites were the original people on the planet with the huge mall. If I remember correction, Pierrot bought a mask from one.